ICE participated recently at the “Sea Japan” trade show in Tokyo, a major event in the Japanese maritime industry calendar. The ICE stand highlighted its design expertise and also showed ICE’s experience with successfully providing design services “remotely” to clients around the world from its Romanian main design subsidiary, as evidenced by successful designs of drill ships and FPSOs/FSOs for clients in Brazil, Japan and Norway. The largest “Sea Japan” event ever, it had around 500 national and international exhibitors and more than 20,000 visitors. 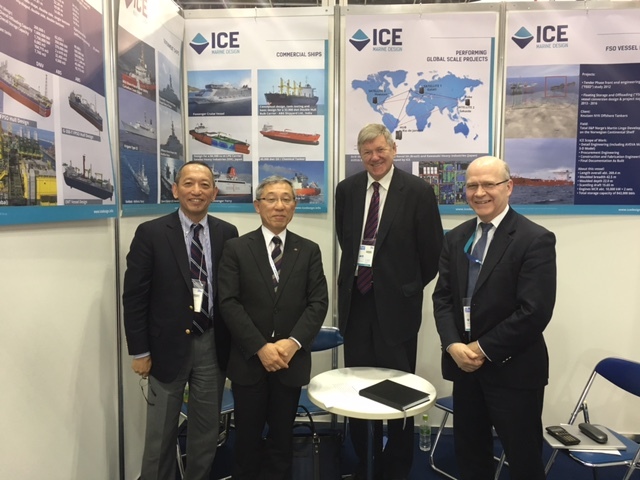 The picture shows ICE’s stand with Mr Kunihiro (second from left), a senior executive of Namura Shipbuilding, one of many visitors. He is seen together with ICE’s local representative Kempu Arisawa (left), Steinar Draegebo and Robert Swan (right).